Sarah came to us first as a new patient with her parents before Christmas. They were looking for a solution for her front teeth. Sarah experienced trauma at 13 years old and her left front tooth fell out at that time and was re-implanted. Sarah had a root canal done within a couple weeks of the trauma, which was the recommended course. As with many trauma cases, over the years Sarah has noticed that tooth and her other front teeth are starting to turn dark because of the trauma. 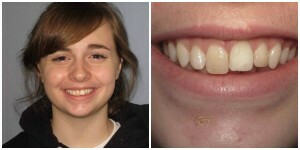 When Sarah was seen in our office, her tooth was showing signs of significant external root resorption. The long term prognosis of the tooth is poor but at the time of her visit with us she was not experiencing any pain or swelling. 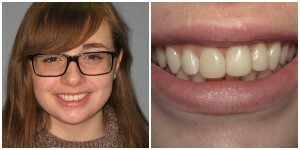 Sarah is currently a senior in high school and wanted to improve the look of her front teeth for graduation and prom. 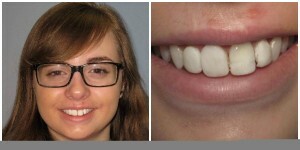 Sarah and her parents weighed different options for restoring her front teeth and ultimately decided to keep her natural teeth for now since they aren’t causing her any pain. They chose a treatment option that will buy Sarah some time and improve her esthetics and also let her finish growing. What was revealed during the comprehensive records process? Some questions Sarah and her parents needed to decide were – how to address the uneven gum tissue levels? How to address the uneven tooth edges? How to improve the color on potentially dying teeth? Save the left front tooth for now or not? How long would they allow treatment to take? What was their budget at this time? To help Sarah and her parents answer some of those questions, Dr. Elizabeth designed different blueprints out of plastic to try directly in Sarah’s mouth to help Sarah and her parents see the results of some of the different treatment options available. In the end, Sarah decided to split the difference on the length of her teeth. She decided not to change her gum tissue levels at this time. She wanted to keep the left front tooth for now. And, she wanted to do as much as we could to improve the color with composite filling material. We all decided to add composite veneers to three of her front teeth and to bleach her remaining teeth for a cost effective way to improve the esthetics for a few years. Sarah and her parents were thrilled with the results! It was a low cost way to keep her smiling through her graduation and into the future! Next Next post: Got Cavities? Your Genetics May Be (Partially) to Blame.